The Pullbox Reviews Deep State #7- Somebody wake-up Morpheus … his dreams are getting deep. In this story arc, there have been more questions asked than on a college exam, or a web based dating site. Who is “Heller”? What is “Odin”, and who’s in charge of it? 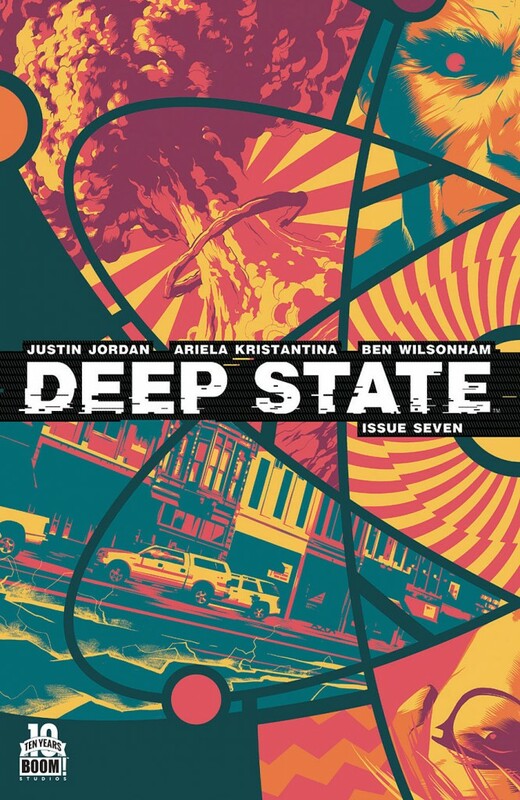 From the man with the time bending sniper rifle, to the retired and forgotten former agent of Control, writer Justin Jordan and artist Ariela Kristantina seem determined to drag us down the rabbit hole kicking and screaming the whole way. All evidence points Agent Harrow and Ms. Branch to the simple and terrifying fact: Control has been compromised. First (in this issue… believe me, this isn’t where you want to jump on for this story arc), Ms. Branch is visited by an old acquaintance, with disastrous results. Next a passage is mysteriously delivered to Agent Harrow’s apartment. “Mysterious” because Harrow has taken every step to ensure that no trail leads back to him and his apartment. The answers seem to lead to “Odin”, the computer program used by Control to monitor pretty much everything in today’s society. If you have a smartphone or an iPad, if anything in your home uses wireless technology, if you have ever just once talked on the phone, Odin knows where you live. What’s more, by showing you the right image, letting you watch the right video clip, at the right time, Odin can do much more than just watch… Odin can manipulate human behavior, and do it so effectively that an old college acquaintance might show up out of the blue to take as hot at you for not returning his calls. So again, the important question is, “What is Odin?” Is Odin an artificial intelligence determined to keep mankind safe by eliminating all things involving free thought. Or, is Odin just a computer program, albeit an outrageously sophisticated one, an uber-expensive tool that has been put into less than benevolent hands? I’ve been on this series since the beginning, and I’ve liked pretty much everything about it so far… The writing is intelligent and gives nothing away for free, and the art does a fantastic job of showing us just enough of the horror without overloading us on it like that one episode of Game of Thrones that gave you the shivers. There are no superheroes or villains running around in tights. This is people dealing with extraordinary circumstances, and keeping the secrets that no one should have to know.